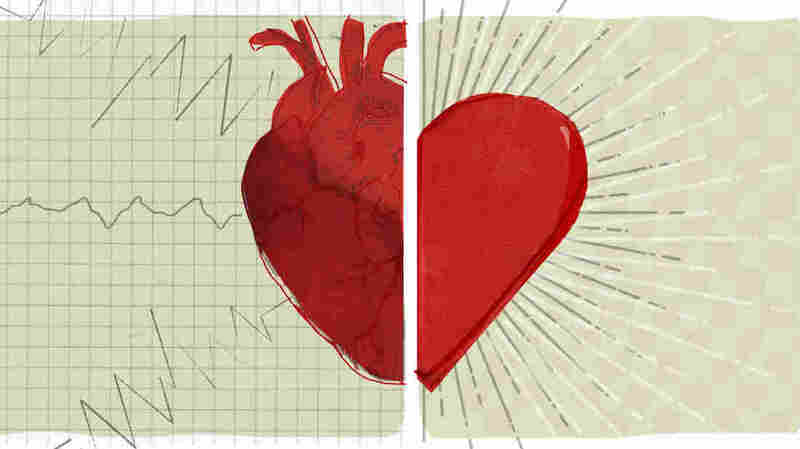 Heart Of The Matter: Treating The Disease Instead Of The Person : Shots - Health News When a man winds up in the hospital after a heart attack, he feels the doctors and nurses treated him poorly. But they have a completely different view. They see his case as a resounding success. A 56-year-old man is having lunch with his wife at a seafood restaurant just outside Boston when he develops crushing chest pain. He refuses an ambulance, so the man's wife drives him to the ER. When the man arrives in the ER, he is told to take off his shirt. He lies in the hallway, in pain, naked from the waist up. Strangers surround him. They don't introduce themselves, and they talk over him, at each other. Pagers ring and there's a lot of beeping. Someone else must be really sick, he thinks; that must be why no one is paying attention. They are both surprised when they find out, two days later, that he's had a heart attack. As soon as they get home, they file a complaint with the hospital about their terrible experience. The doctors and nurses arrive and bring the patient up to the catheterization suite. There, the attending cardiologist threads a catheter through an artery in his groin and pushes it all the way to his heart, where the doctor sees on an X-ray machine that a vessel is blocked. She inflates a small balloon in the catheter, opening the artery and restoring the flow of blood to the man's heart. All told, it took only 22 minutes from the time the man entered the hospital for the cardiology team to clear the blockage. The cardiology team is proud that they beat the national average for what they call door-to-balloon time by 42 minutes. The faster a blockage can be cleared, the better the odds are for a full recovery. The patient gets well without complications. Two weeks later, he's back at work and exercising again. The ER and cardiology teams consider the man's case a resounding success. Why then are there such different views of the same ER visit? Who's right? The doctors who believe they delivered exemplary care, or the patient and his wife who feel he was treated badly? As an emergency physician and advocate for my patients, I frequently hear clashing stories like these. When I review the cases, I find that the doctors and nurses are often surprised by the patient's complaint because they did everything by the book and made no medical mistakes. The objective measures that health care workers focus on are necessary, but they're not enough by themselves. Every provider in this man's case had good intentions and was working hard to respond to the medical emergency. But in their rush to open the blocked heart artery, they treated him as a disease to be cured, not a person to be cared for. Would it have alleviated the patient's anxiety for the doctors and nurses to introduce themselves, and to ask if he wanted his wife by his side? Would it have helped to assure him that all the activity was happening around him because everyone was trying to take care of him? These instructions aren't on typical checklists for treatment of heart attack, yet they are part of caring for people as human beings. In modern medicine, we are fortunate to have incredible high-tech options available, but we must not forget the low-tech approaches that can improve communication and quality of care. Patients and family members can also speak up when they are confused and scared. It's possible that doctors explained what was happening, but not clearly enough. What if the patient said he didn't understand what was going on? What problems could have been avoided if the patient and his wife didn't wait until after he was discharged to raise their concerns? The two viewpoints of this ER visit end with one thing in common. Just as the providers were surprised by the patient's complaint, the patient and his wife were taken aback when the team that I was part of presented them with their doctors' point of view. "We had no idea they were trying so hard," the man said. "It's too bad we didn't know that at the time."